“Where do I start?” That’s the main question I get from parents and students alike, and that’s what I’m here to answer. With over 20 years of experience in higher education combined with almost 15 years in the private sector, I am dedicated to getting your student on a personalized and highly effective track to finding the right college fit. I take a thoughtful and immersive approach to each student, analyzing their needs and developing a plan of action that will lead them to success; admission to a college that fits their academic, social and financial needs. My own college pursuits led me from my local community college to a public four-year state school to a graduate degree from a prestigious Ivy League institution. I hold a graduate degree in Student Personnel Services from Columbia University and a Bachelor of Arts degree in Speech from the State University of New York at Plattsburgh. I worked in higher education for 20+ years as an admission counselor, Director of Student Activities and as an adjunct professor in Speech Communication. 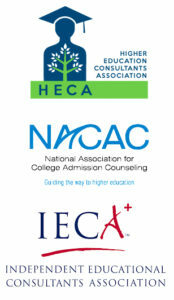 I completed UCLA’s College Counseling Program and am a member of professional organizations including the National Association for College Admission Counseling, Higher Education Consultants Association and Independent Education Counseling Association. My daughter, Mary, is a graduate of Ithaca College in New York and my son, Marc, is a graduate of Keene State College in New Hampshire. The college process is always changing. I stay on top of the industry trends by taking classes frequently, attending conferences and workshops for my various college consulting organizations, and traveling extensively, visiting colleges and universities every year. The “right” school may be a hidden gem that you haven’t yet heard about, and it’s my job and my passion to help you find it.